Not only have I been kissed I also feel like I have been licked by Olive and Chamomile. This soap is bitchin and super big. Any big, rough-and-tumble kind of guy will really dig this soap. Kiss my Face might have hit the ball out of the park with this soap. 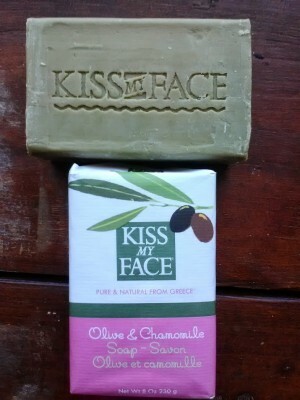 This soap is made in Greece where some of the Worlds Best Olives come from. This soap rubs on thick and rich and you instantly feel the moisturizing power of Olive. Chamomile is suppose to relax you when drank but when it comes to skin I am not to sure if my skin felt any mellower but I’ll go with it. I must have soap for any Guy or Gal looking for a great feel good soap, shower or bathing experience. Qualities: Olive, Chamomile, Pure, No Artificial Color, Biodegradable, Gluten Free, No Animal Ingredients. Very Rich, Super Moisturizing, Mild Scent. Feels like you are getting kissed and licked.